Mrs. Homa Arzhangi, poet, writer and translator was born in Tehran in 1944. She is the last daughter of late poet, painter and sculptor, Rassam ARZHANGI. She finished her studies in English literature at the university of Tehran where she also studied French. During several years she taught in National education in Iran. She has been very active since her teenage years in : music, poems, theater and painting. She spent a few years of her life studying mysticism and oriental and occidental philosophy. She finally chose, Buddha’s method called Vipassana as a meditation technique. She has a great admiration for Molana Djalledin Mohamed commonly called MEVLANA and her mystic poems are inspired by him. Four of her poem books, entitled “Lovers ascension”, “Thousand petal lotus”, “the secret of ascension” and “stone carver” were published respectively in 1994 by Modaber editor, in 2000 by Almoga Editor, in 2006 and 2014 by Samarcande Editor. In the translation field, we can name the following books : “Tantra experience”, “the gracious flow of Dhamma” and “ The lost army”. 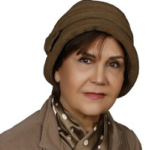 Lots of her poems have been published in Iranian newspapers (Katibeh) as well as in Iranian newspapers out of Iran : Rahavard and Mirass in the USA and Rahe Asha in Canada. She spends now her time between Iran and France.